Browse: Home / Did the Jews Lose Europe? Following the European poll, Dave Rich, deputy director of the ultra Right Wing Jewish para-military Community Security Trust, is concerned. He detects a growing resentment of Jewish politics in Europe. 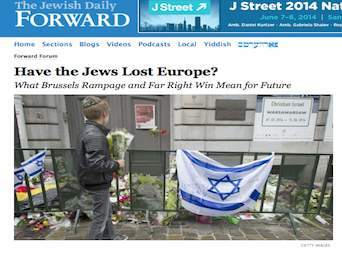 His article in the Forward’s openly examines whether Jews have lost their grip on the European continent. Rich concludes by arguing that European Right Wing politics “are not driven primarily by anti-Jewish sentiment … And Europe’s Jews do not need our American friends to remind us where that can lead.” Rich is correct here, the surge in political awareness of the European underclass and impoverished middle class is not driven ‘primarily’ by anti Jewish feelings, however, increasingly, political commentators identify European malaise with Jewish and Zionist politics. The European new Left was badly beaten in last week polls due, in large part, to its Jerusalemite nature and affiliation. The new left in Europe is driven by kosher ideology, it is dominated by Jewish lobbies such as LFI (Britain) and CRIF (France) and if this is not enough, the entire progressive dissent discourse is closely identified with Jewish interests and is largely funded, directly and indirectly, by liberal Zionists such as George Soros and his Open Society Institutes.